Tongue-wagging has given way to tool-wielding as residents of God's Isle mark the first anniversary of a £4m community buy-out. Islanders have spent much of the first 12 months involved in meetings to decide the way forward. But now community leaders are pleased that physical work is starting to take shape as they look to improve residents' prosperity. Workshops are under construction and plots of land have been earmarked for more housing on the island, off the west coast of Scotland. Willie McSporran, the chairman of the Gigha Heritage Trust, admitted: "Most of this year has been nothing but talks and meetings. "What grants can we get? Where are we going to build? What are we going to build? What is the best way forward? "Now at least there are craft units on the way. That is the first sign of bricks instead of tongue-wagging." 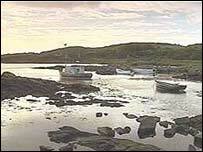 Gigha is the southernmost island of the Inner Hebrides, accessed by a 20-minute ferry journey from the Mull of Kintyre. It is often called God's Isle, a rough translation of the name "Gudey" given to it by the Vikings. 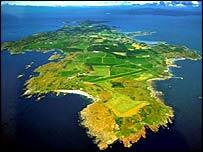 The community raised £4m to buy the island when it was put up for sale by businessman Derek Holt in 2001. The 110 residents set up a community trust to bid for the land, securing £3.5m of lottery funding in the process. Since the island officially passed into the community's ownership last March dozens of homes have been refurbished. Lorna MacAlister, the head teacher at the island's primary school, pointed out that there were also plans to build 10 houses in the near future. She hoped this would lead to an increase in the number of children on the island. At present there are only seven pupils on the school roll. "The children would like to see it a lot busier, and hopefully in the near future that will happen," she said. The other development opportunities being examined for the island include plans for a wind turbine. Tenant farmer Kenny Robinson is among those who are feeling renewed optimism. "My wife and I are far more relaxed now," he said. "We feel that we have got a more friendly landlord and it has certainly made us look to the future more." "A huge programme of renovation is about to begin"